The Blender Girl, Tess Masters, did a happy dance the day she used Massel beef-flavored stock to make this incredible Vegan French Onion Soup. The cheesy bread is pretty special too. In a large pot over medium heat, sauté the grapeseed oil, onions, garlic, thyme, bay leaf, and 1/4 teaspoon salt, and cook the onions for about 30 minutes until the onions turn golden brown, and caramelize. Add the wine to deglaze the pan, increase the heat to high, and bring to a boil. Reduce the heat to medium, and simmer uncovered for about 5 minutes until the wine has evaporated. Add the Massel beef-flavored stock, tamari, balsamic vinegar, and 1/4 teaspoon pepper, increase the heat to high, and bring to a boil. Reduce the heat to medium, and simmer, uncovered, for about 15 minutes to allow the onions to melt into the stock and the flavors to mesh. Season with the remaining 1/4 pepper and salt to taste. Set your oven on very low to the warm setting. Pour the Massel vegetable stock, drained cashews, nutritional yeast, lemon juice, salt, mustard, onion powder, garlic powder, pepper, and paprika into your blender, and blast on high for 30 to 60 seconds, until smooth and creamy. Pour the batter into a large shallow baking dish. In batches, place slices of bread into the baking dish on one side and soak for 8 to 10 seconds until coated evenly. Turn over for another 8 to 10 seconds until coated evenly. Into a small skillet (that fits two slices) or on a large griddle that holds all of the slices over medium heat, pour 1 tablespoon of grapeseed oil per two slices of coated bread and fry for about 2 minutes on each side until golden brown and crispy on the edges. The amount of time and oil required will depend on your skillet and stove. Resist the urge to use less oil, or the bread won’t get crispy. Transfer this first batch of bread to the oven to keep warm, and repeat the process, frying the remaining slices of bread, if doing so in batches. Keep the bread whole to serve on the side, or cut each slice into quarters or in tiny crouton-sized squares to place on top of the bowl. 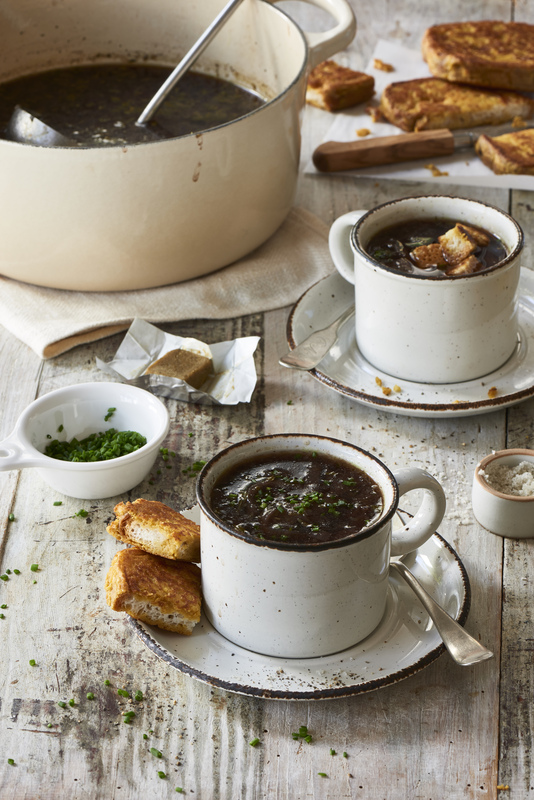 To serve, ladle the French Onion Soup into bowls and top with cheesy bread, or serve family style at the table.